Highly acclaimed UCLA Women's gymnastics coach of 7 NCAA championships Valorie Kondos Field shares insights on how to use uniqueness and authenticity to achieve success. Miss Val has shaped her UCLA Gymnastics program as a life skills class and now she's sharing those lessons with you, whether you're an athlete, business leader, or simply someone who wants to own their destiny. Miss Val's philosophies are timeless. Her coaching style is unorthodox. 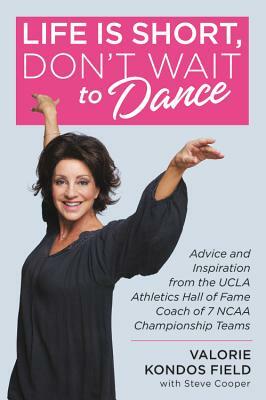 Life Is Short, Don't Wait to Dance is a thought-provoking, fun journey through the anecdotes of the 35-year career of a dancer/choreographer turned athletic coach. The book includes unforgettable stories of the Olympians and athletes with whom she's worked-including the inspirational journey of Katelyn Ohashi, whose joyful transformation under the tutelage of Miss Val was evident to the world when her perfect 10 floor routine went viral -- reaching over 100 million viewers. Other triumphs include Olympian Jamie Dantzscher, who found her confidence at UCLA and learned the tools to combat her previous abuse; and sensation Christine Peng Peng Lee, who helped the Bruins clinch the 2018 NCAA championship with back-to-back 10's. Miss Val also shares her favorite memories of her mentor, legendary basketball coach John Wooden, as well as her thoughts on Larry Nassar and the gymnastics sexual abuse scandal. Miss Val reveals how her coaching journey had a rocky start before she found her own best approach. In time she realized that her dance background wasn't a detriment, it was a gift. When she embraced this, Miss Val led the Bruins to victory. Life Is Short, Don't Wait to Dance is packed with great advice for anyone on a quest for success, delivered in Miss Val's reassuring and inspirational tone. She took the same approach to her breast cancer diagnosis, explaining how she made that struggle into one of the best years of her life. For Miss Val, it's all about attitude. Life Is Short, Don't Wait to Dance is a powerful book that shows you how to make the leap of faith in choosing your own path to greatness. "The title of Valorie Kondos Field's book, Life is Short, Don't Wait to Dance, offers wise advice, a metaphor and a tribute all at once. The coach of UCLA's women's gymnastics team built her extraordinarily successful career on encouraging self-direction and being 1% better each day at a form of expression that feeds your soul." "Life is Short Don't Wait to Dance is an incredible book." "Miss Val's coaching technique really appealed to me because it was very different than elite gymnastics. She always reminds me before meets, never take life for granted and to cherish every moment." "She nurtures that kind of potential into so much excellence that even standing in a room with her and listening to her speak can bring you to a level you didn't even know you had in you." "It's really easy to give up when things are not going your way, or when things are challenging, or when you have adversity or struggle, but she always stays positive." "Having a role model like Val early in my college career was really important to me because I saw the interaction she had with the women on her team and how winning was certainly important, but not the most important thing." "To watch her work with people who have won gold medals in the Olympics... it's one thing to be an exceptional athlete it's another thing to have this emotion bleed through your athleticism to take that sport to an entirely different level." "She has this reputation within the gymnastics community of not only being a great gymnastics coach, but also a life coach, a mentor and a friend."